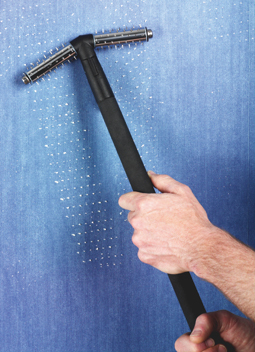 The HTP Wallpaper Perforator is a high quality hand tool designed to quickly and safely perforate all types of wall covering to speed the penetration of steam for fast, effective wallpaper stripping. The HTP is the perfect partner to the HTW Steam Team Wallpaper Stripper. The configuration of the twin roller perforating head with 56 hardened steel pins per roller, cuts 'V' shaped perforations into the wall covering as it is rolled across the surface maximising the penetration of steam to the glue line. The design effectively 'grabs' the wall covering without the need for the user to apply excessive pressure for the perforator pins to penetrate the wall surface. Safe to use on all wall types including plaster, plaster board and drywall linings. Use on all types of wall covering including vinyl, foil, flock, wood chip and multi-layered papers, including painted-over wallpaper. The HTP has an easy grip soft rubber covered handle that minimises fatigue over prolonged periods of use. The perforator yoke pivots and in combination with the skid keeps the perforator head at the correct angle at all times, stopping unnecessary pressure from being applied and preventing damage to the underlying wall surface. 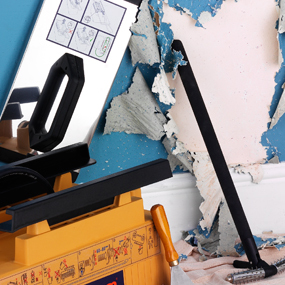 Combined, the HTW Steam Wallpaper Stripper and HTP Wallpaper Perforator is the most effective and productive wallpaper stripping system available. 112 hardened steel perforator pins. Perforator head pivots in combination with skid. 'V' shaped perforations speed steam to the glue line. Suitable for most types of wall coverings and wall surfaces.